stand up straight and be brave. You will soon be set free. "Don't spend all of your time thinking about eating or drinking or worrying about life. If you do, the final day will suddenly catch you like a trap. That day will surprise everyone on earth. "Watch out and keep praying that you can escape all that is going to happen and that the Son of Man will be pleased with you." 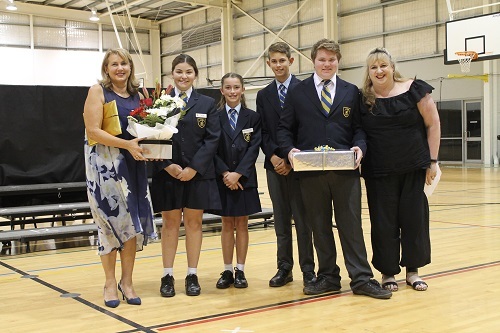 Wednesday night was a wonderful evening where we celebrated another successful year and the achievements of our students. 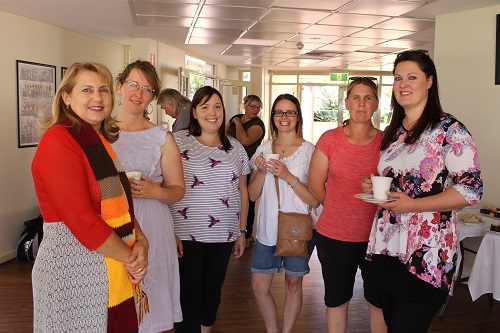 We were joined by many distinguished guests including Dr Debra Sayce, Executive Director CEWA, Hon Darren West, Sr Jaqueline Jones and Br John Horgan. It was a marvellous evening showcasing our Choir and acknowledging the Leaving Class of 2018. We thank all those who attended and the many who helped behind the scenes. As you can imagine, there is a lot of preparation for such a night. We sincerely apologise that an error was made on the night and wish to announce that the winner for Year 12 Integrated Science General was Janelle Yeates. A list of prize winners is provided with the newsletter. 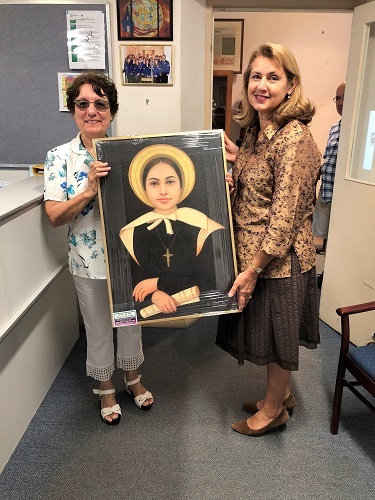 After our Presentation Night, Sr Jaqueline Jones visited our School campuses and gifted us with a beautiful portrait of an impression of St Emilie as a young girl. It is a wonderful new image for our students to remind them that Emilie, like them, was a young woman who experienced some difficulties in her life yet chose to devote her life to serving God and others. What can I say about the Primary Assembly this morning! What a fantastic surprise for me! Dr Who, ABBA and our beautiful School all rolled into one. I thank our Year 3 class and Ms Chan for their creative and heartwarming farewell this morning. I'm afraid the tears did flow by the time I had to speak to our students. I will certainly miss this community. Thank you to all our wonderful volunteers who help throughout the year. 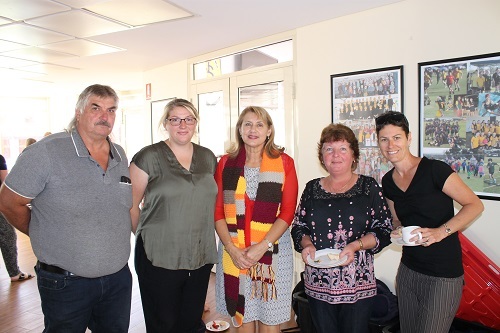 We were pleased to host a ‘thank you’ morning tea today. We appreciate the sense of community and ‘pitching in’ that is evident in our School. Jakeb Fudge and Jarred Patmore and Mr Vernede returned this week from their attendance at the Marist Leaders Camp. 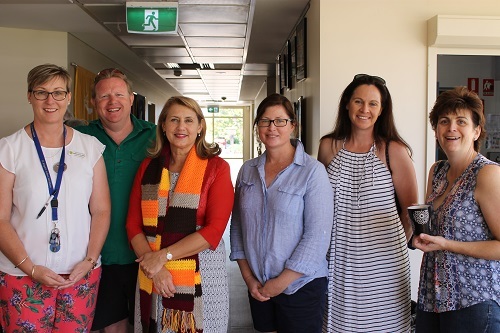 Our two leaders appreciated the time spent with school leaders from other Marist Schools. We thank the Marist Association for sponsoring our students. We look forward to having the students use their new skills and knowledge at St Joseph’s School. 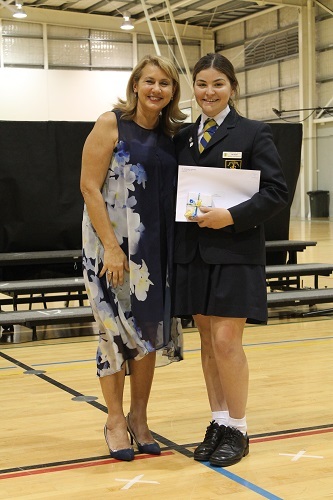 This weekend, we farewell Ms Hendriks and Ashlynne Beckett (Year 11) as they join Seton College on their immersion trip to Thailand. The group will spend 10 days at one of our sister schools in Thailand where the Sisters of St Joseph of the Apparition run a boarding house and school for Thai children to receive a primary education. Staff are busy preparing student reports. It is our intention that reports are posted home (and made available on SEQTA for Secondary students) on 10 December. As we approach the first Sunday of Advent this weekend, we are reminded that the waiting period is a time for us to prepare for the birth of Christ. In this very busy season, we encourage families to spend time reflecting on the true meaning of Christmas and on the joy of having Christ with us in our daily lives. Next week is the final week of school for our students. Students will be busy finishing their work and I know there are some special events prepared for them. The Year 6 Final Assembly will be held on Wednesday 5 December at 9.00am and our Final Primary Assembly (usually with a special visitor wearing red!) will be held on Friday 7 December at 11.30am. 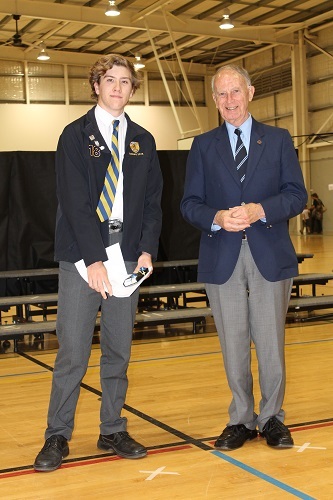 Secondary students will also hold their final assembly on that day. Emily Fergusson has been accepted into the Midland Guildford Cricket Club’s U/17 Youth Female League Squad for 2018/19. The squad is a selection of talented female cricket players from the eastern suburbs and will be training and playing games from 2 December to late March next year. Congratulations, Emily, we are very proud of your achievements and wish you the best of luck over the summer season. Unfortunately, this week has seen a few major vehicle crashes in our local area. Our Counsellor and staff have kept an eye on our students and helped with those experiencing stress or concern. Constable Frankel from the WA Major Crash Investigation Team has provided us with information regarding further support that is available. Please refer to the pamphlet attached to the end of this newsletter. Last day of Term 4 for students: Friday 13 December 2019 (to be confirmed). St Joseph’s School has commenced our annual Advent Appeal. Donations of long-life foods, tinned and other Christmas goodies will be appreciated. An Advent bag is located in each classroom to enable you to send in or drop off any donations. These Advent bags will be handed to the Parish (St Joseph’s Care) at our final Christmas Assemblies. Next week there will be a number of assemblies to recognise the achievements of our Early Years students and our Year 6 students and celebrate the wonderful year that we have had on the Primary Campus. Year 6 Final Assembly - Wednesday 5 December at 9.00am. 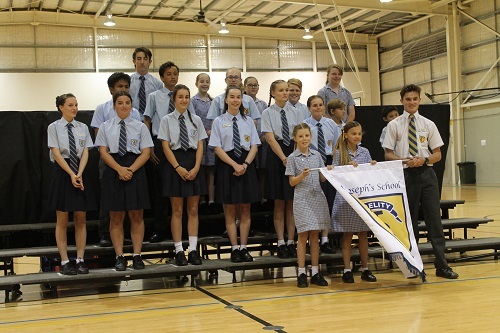 The Year 6 Assembly is to celebrate the conclusion of the primary schooling of our Year 6 students. 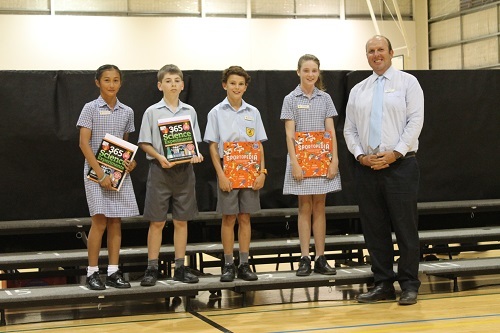 An invitation has been sent out to all Year 6 parents to join our school community to acknowledge these students. At the conclusion of the assembly, we will be having a Year 6 Morning Tea. Please bring a small plate to share. Our Final Christmas Assembly will be held on Friday 7 December starting at 11.30am. This will be followed by a Sausage Sizzle lunch provided by Mrs Carmel Moore and her many canteen helpers. After lunch, parents are able to sign their child/children out and take them home. All classroom teachers will have a SIGN OUT sheet for parents to sign before their child leaves the school grounds. The collection of lost property has grown over the semester, in particular school jumpers and lunch boxes. Please encourage your child to check the lost property boxes in the foyer of the SMPAC to see if any items belong to them. At the end of term, all lost property will be donated to the Uniform Shop or the St Joseph’s Parish Op Shop. 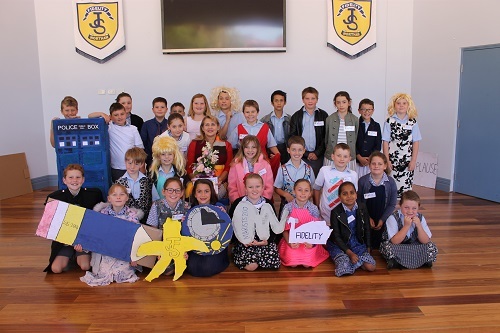 The annual Year 6 FunD Day was another great example of the wonderful experiences we offer our students on the Primary campus. The Year 6 students organised and ran some fabulous, creative stalls with all monies raised being donated to St Joseph’s Parish Care. Well done to the students and teachers involved. 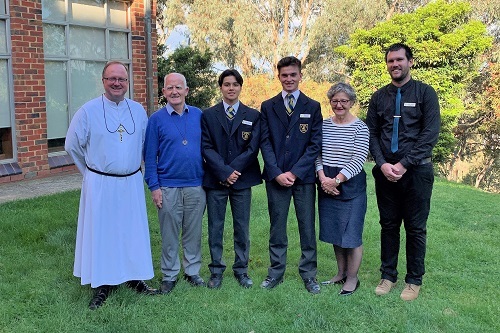 As Secondary School Captains for 2019, we were provided with the privilege of attending the Marist Student Leaders Gathering in Melbourne from 25 to 27 November. The Gathering was a very confronting, yet beneficial, experience which enabled both of us to take a major step towards reaching our full potential and being the best leaders we can be for St Joseph’s School. 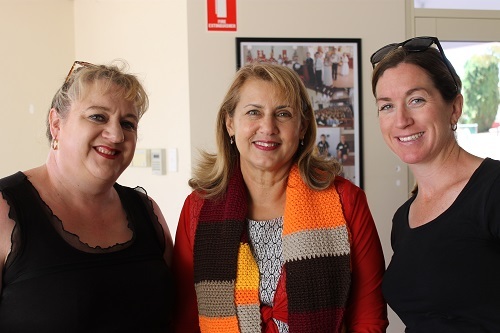 During the Gathering, we were able to make new friends amongst other leaders from Marist schools across Australia and form new friendships that will last a lifetime. Some highlights from the Gathering included getting into assigned discussion groups for the quiz night where the fun and competitive spirit made for an enjoyable time. Also, the leadership workshops that were conducted gave us some tips to improve in certain areas of leadership. As the event concluded, we had gained a new understanding of how to lead in the footsteps of Marcellin Champagnat and will do our best to bring these qualities that we’ve learnt back to the St Joseph’s School community. We were humbled to have this opportunity to participate in such an educational but enjoyable experience, full of lasting memories. We would like to thank Mr Vernede for giving up his time to attend this inspirational event, supporting us and enjoying the experience also. Australia. This included learning how to use coding to run a professional telescope remotely. As the students needed to identify suitable objects to image, they also developed a working knowledge of celestial coordinates, selecting appropriate times to image objects through the use of online software. After deciding on suitable targets and writing lines of codes, the students accessed the telescope at UWA for their first imaging run. After much success and a few new targets selected, along with different exposure times, the students completed some additional imaging, including being offered time on Spirit-4, which is a remotely operated telescope based at the Gravity Discovery Centre at Gingin - a site the students visited earlier this term, usually reserved for university students and researchers. In addition to image collecting, the students also contributed feedback on the use of this telescope and its operating capabilities. 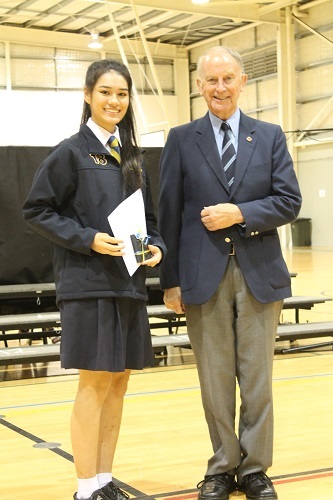 High Distinction (Top 1% in WA): Tama Peipi - Year 9. 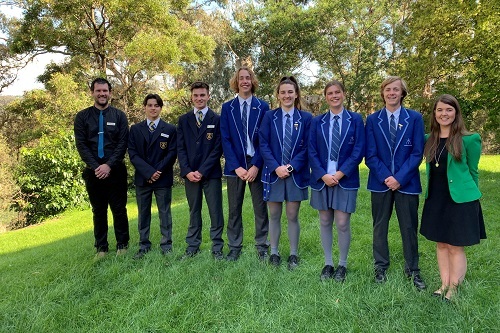 Distinction (Top 15% of WA): Eric Good - Year 9.
Credit (Top 30% of WA): Audrey Carroll & Isabella Crees - Year 10, Tara Bishop, Tyler Kilmurray & Lara Schmidt - Year 9. There have been a number of recent reports of suspected chicken pox (varicella) in the Northam area. Chicken pox is a viral disease that starts with cold-like symptoms: e.g. a runny nose, mild fever, and feeling unwell. A rash with red, itchy raised lumps then appears and can extend to all parts of the body. The lumps dry to become blister-like in appearance. Chicken pox is contagious from about 1-2 days before the rash appears and until the blisters have dried, usually 4-5 days. The usual time between contact with the virus and development of the illness is about 14-16 days, although sometimes it can be longer. Chicken pox is spread through coughing, sneezing and direct contact with the fluid in the blisters of the rash. Any child with chicken pox should be excluded from school/day care until the blisters have formed crusts. Chicken pox is a vaccine-preventable disease: if your child has not been vaccinated at 18 months of age, please contact your local GP or child/school health nurse. Any child/parent/staff member with symptoms should see their doctor as soon as possible. Further questions and information can be directed to and obtained from the Wheatbelt Public Health Nurses on 9690 1720. Our modern society makes it very easy for children to gain too much weight too quickly. More than a quarter of Western Australian children are overweight by the time they start school. It is so common that it is difficult to tell what is ‘normal’ anymore as overweight children may not look noticeably large. As children move through puberty and into adulthood, being overweight often becomes more obvious and more difficult to manage. It is easier for children to move towards a healthy weight before puberty and adulthood. provide fewer soft drinks and fruit juices. With Christmas not too far and school holidays looming, parents/caregivers are reminded that the School Dental Therapy Centre will be closed over the Christmas holidays from and including 24 December 2018 to 28 January 2019. The Centre will re-open on 29 January 2019. If it has been some time since you visited us, your contact information may have changed and we may not be able to reach you to offer your child or children dental appointments. If you are unsure about your contact details with us, please contact us on 0458 644 530 or email at NorthamDTC@dental.health.wa.gov.au. The School Dental Service is a FREE service for enrolled school children. Children are eligible from pre-primary to the end of year 11 or age 17, whichever comes first. Attending your child’s dental check-up appointment is appropriate to ensure you are informed of your child’s dental needs. Please feel free to pop in or phone if you have any queries or if it is your child’s first visit to meet our staff. Please ensure you have returned your child’s Dental Enrolment Form or they will not be seen for their dental check-up. For after-hours emergency only, phone 1800 098 818 6:30pm–8.00am seven days per week. Date: Wednesday 23 January 2019. Time: 4.30pm Mass in the College Chapel. 5.30pm Barbecue and fellowship in the College grounds. BYO everything. All former students are warmly invited to attend the reunion. Enquiries to Kevin Wringe 0407 511 104 or Ambrose Depiazzi 0419 912 187. RSVP not necessary. Where : Graziers Steakhouse, Greenwood Tavern, Cnr Warwick Road and Coolibah Drive, Greenwood. Elizabeth Turner on 0409 290 947. Enrolments for the coming season are now open. Sessions take place at the Northam Country Club on Wood Drive each Wednesday afternoon for eight weeks beginning Wednesday 6 February to 27 March 2019. Lessons cater for all ability and ages from 4 to 18 years and are conducted in small groups with experienced coaches from Team Tennis WA. For further information, please contact Lynne on 0427 980 989.
accepting that ZERO is achievable. To find out more about our road safety initiatives, visit www.sdera.wa.edu.au. For more information about the Road Ribbon for Road Safety® campaign, visit the RoadWise website; www.roadwise.asn.au/road-ribbon-for-road-safety.aspx. The 2018 Northam Community Carols will be held on Henry Street Oval on Saturday 8 December. A family fun zone will be held from 5.00-7.00pm with the Community Carols being held from 7.00-8.30pm. Food, coffee and cold drinks will be on sale from 5.00pm. 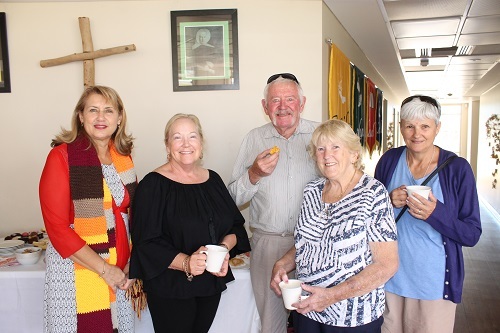 All proceeds will go to support Chaplains throughout the Wheatbelt region. This is an alcohol free event. BYO blankets and chairs. For more information, contact Bridgeley Church of Christ on 9622 3981. Proudly supported by The Salvation Army, YouthCare Chaplaincy, Shire of Northam and Bridgeley Church of Christ. On Friday 7 December, the Canteen will be offering a sausage sizzle for lunch ($3 sausage in a bun and all drinks at $2 each). Please note that no other menu will be available. Recess will be as normal. I would like to sincerely thank all our parents, caregivers, grandparents and other members of the School community for your assistance and support of the Canteen during 2018. Without your generous support, we would not be able to provide this service to our School.